The Meiji Gallery in Aoyama Itchome holds 80 works of art depicting scenes from the life of Emperor Meiji (1852-1912), half painted in the Japanese style and half in a Western style, each about 3 meters square and really quite stunning. I discovered this Gallery unconventionally. In fact, I’d thought a long time ago that the museum/impressive building scene in Tokyo was played out for me. I’d been through several solid guide-books and already visited every place that seemed of interest. It seems I was wrong. I saw the Meiji Gallery from the City View Observatory on the 54th floor of the Mori Tower at Roppongi Hills. At first I thought it was the Government Diet building, but later that week I saw it again from the 14th floor of another building that I work at nearby, and my students told me it was a museum. I was very surprised, and resolved to visit it. Finding it though was a little tricky, since I didn’t know it’s name, and a simple Google search yielded nothing. Instead I had to resort to Google Maps, hunted it down, found it’s kanji, transcribed them using the kanji-draw and translate function on my Nintendo DS lite, then input that into Google Search. Finally- it yielded the information: the gallery of Emperor Meiji. Well, yesterday I went along. Of course, there are no photos from inside, and few from outside since it was a terribly rainy day- but here’s the website, translated into English. 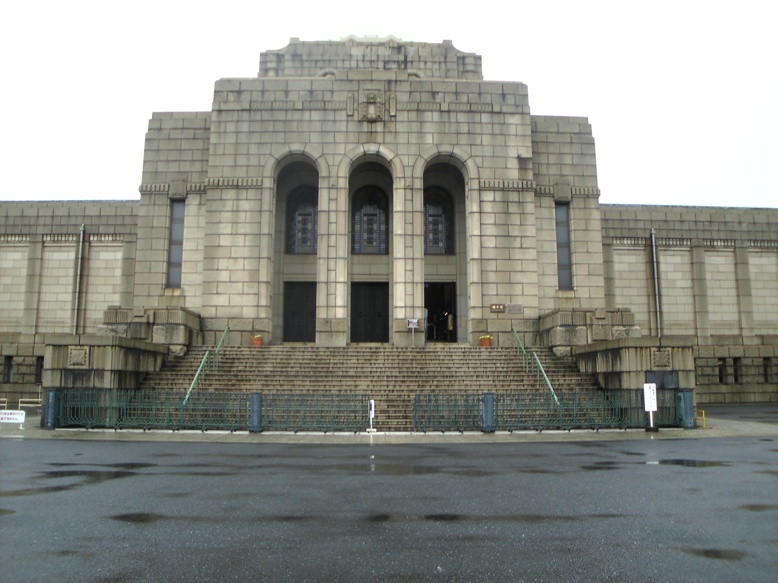 It’s worth the trip for the building alone- which by Japan standards is OLD- completed in 1925. Look out for the stained glass front windows. The paintings also are excellent, and in great condition considering their age. There is also a stuffed horse in the back- which was Emperor Meiji’s favorite. He had it stuffed and wanted it close to him after he died- rather like an Egyptian pharaoh- which doesn’t seem so strange when you consider that prior to World War 2 the Japanese actually believed that their Emperor was a God. 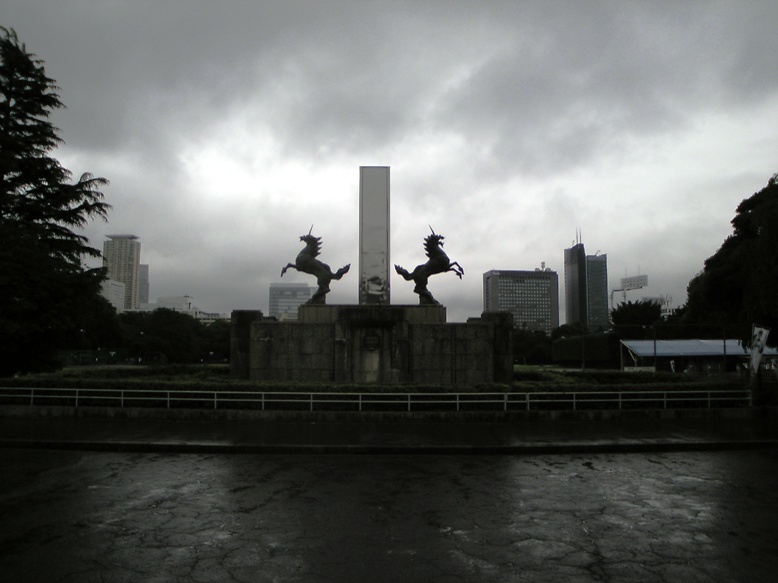 Here are unicorn/snake-face horses in front of the memorial building. On the left you can just barely see the Mori Tower at Roppongi Hills- the round building behind the khaki colored oblong building. I’ve ridden my bike in this area and it is quite maze-like. Lots of places, like the large park I thought would be cool to go in, is off limits to the public. Use of Googlemaps is a nice feature, that a WP plugin? If so, which one? Not a plug-in, just lifted straight out of Googlemaps. I’ll probably head back there on a nicer day and check out the golf driving range.